These days both kids and parents alike seem to be glued to their smartphones like never before. Just in time for the summer vacation, Alamo Rent A Car wants to keep the gang connected with mobile games aimed at family roadtrips. 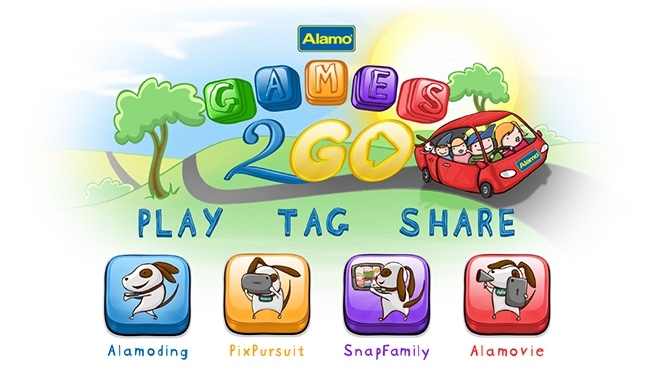 Participants can submit content using #AlamoGames2Go for the chance to win items every week as well as a $5,000 grand prize. Participating bloggers will host individual contests as well. While the games are designed to be engaging, the marketing plan is also worthy of attention. In a campaign aided by Alamo's digital agency 360i, the Clayton, Mo.-based brand has partnered with eight mom bloggers who will leverage their websites and Twitter followings to push AlamoGames2Go. Writers for sites like A Nut in a Nutshell, Mommy Musings and 2 Wired 2 Tired will tweet about the games through Sept. 16. Alamo will push some messages via Twitter's Promoted Tweets, in addition to Facebook ads and national radio spots. "It's about reaching our target audience, which is head-of-household moms," said Meghan Maguire, Alamo's brand publicity manager. "They are already playing in those [social] spaces, posting pictures of their family. This is a program to reach them while building brand awareness."